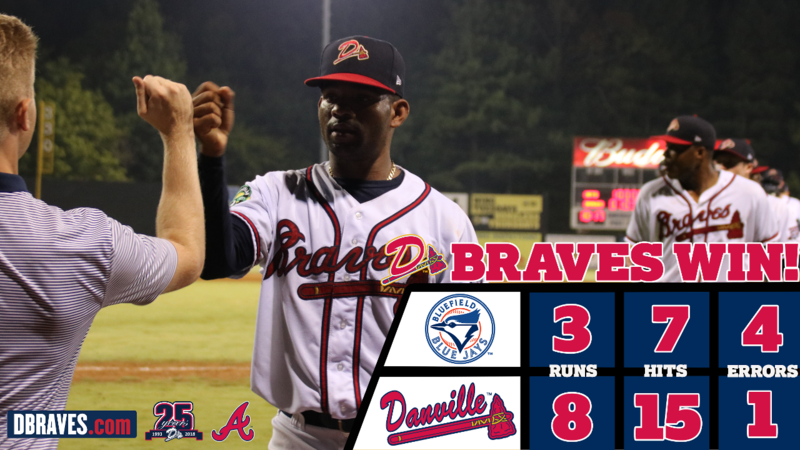 The D-Braves finished 18-17 at home and improve to 31-31 on the year. Nicholas Shumpert laced a two-run double down the left fielder line to extend Danville's lead to 6-3. Shumpert boasted his second straight 2-for-5 day and drove in four D-Braves on the day. Henry Quintero followed with a broken-bat single to widen the game to 7-3. Quintero recorded his third consecutive multi-hit game with a 2-for-4 day at the plate. Griffin Benson scorched a double down the right field line, scoring Henry Quintero. Benson went 2-for-5 at the plate with an RBI. After Bluefield notched a 3-2 lead in the top of the sixth inning, Danville came back with a pair of their own in the bottom half. With a leadoff single from Justin Smith and high-towering double off the bat of Rusber Estrada, Carlos Baerga drove in Estrada on a slow ground ball to second, making it a 3-3 game. Shumpert reached on miscue from Blue Jays third baseman, Luis De Los Santos allowing Estrada to score and giving Danville the 4-3 lead. Danville overcame a 2-0 deficit in the bottom of the fifth. Shumpert smacked his first of two doubles on the day, driving in a pair. The Braves bullpen combined for seven innings of relief, allowing one run and three hits and striking out seven Blue Jays. The D-Braves will finish its season on the road at Princeton on August 24-26 and at Bristol from August 27-29.